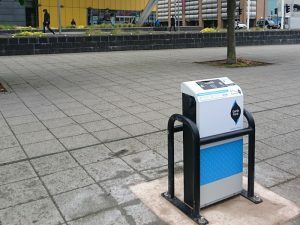 Charging points deployed in Coventry city centre under the Plugged in Places project are being replaced with new chargers linked to the GeniePoint network. The Plugged in Places project chargers are being replaced by new chargers linked to the GeniePoint network. The project, carried out by GeniePoint network operator ChargePoint Services working alongside Coventry City Council, sees the seven former chargers replaced with new Twin Socket 7kW chargers, with two in Croft Road and Little Park Street and three at the Memorial Park & Ride, all of which are now up and running, while the location for a further two chargers is still to be confirmed. The chargers can be accessed by drivers via RFID card or smartphone, backed by 24/7 support from ChargePoint Services’ customer care team. The next phase of the project will see rapid charging facilities also deployed in the city.